It's a rare occurrence now a days to find a horror movie that actually scares. Sure, some are a bit creepy and others load on the gore to the point that you have to look away but the ones that make you uncomfortable, that make you wrap the blanket a little tighter and maybe sleep with a light on, those are a rare occurrence. Franck Khalfoun's Maniac doesn't quite reach the level of sleeping with the light on but it definitely left me unsettled. Based on William Lustig's 1980 movie of the same name, this new iteration has been updated by the writing duo of Gregory Levasseur and Alexandre Aja who together wrote Khalfound's directorial debut P2 along with High Tension among others. This is more of a loosely based story than a direct remake, borrowing heavily from the original but also changing quite a few of the situations. Elijah Wood stars as Frank, a mannequin restorer with a dark secret. He spends his days salvaging and restoring old mannequins and his nights hunting beautiful young women whom he scalps. He then adorns his mannequins with their hair and plays pretend with them until the need to kill rises again. When he meets Anna, a beautiful young photographer with a love for mannequins, he feels a pull of another kind and it's his encounter with her that leads to his ultimate undoing though you have to figure that at some point, he'd be found out anyways. It requires quite a bit of suspension of disbelief to jump into this story, it's not like Frank is pulling in street girls who won't be missed. His victims are women with families and friends and homes but if you can overlook that little fact, Maniac plays out as one of the more terrifying movie experiences I've had of late. Part of the movie's success is its superbly effective use of POV, a gimmick that often crops up in movies but is rarely used this well. Watching the events unfold through the killer's eyes and the fact this style is rarely broken, with a few minor exceptions, is uncomfortable and the discomfort gets worse with each passing scene. By the time Frank chases a woman through the subway, it's almost too much to bear. It may explain why, near the end of this scene, the movie drops out of POV for a moment. It's startling when it happens and I don't fully understand its purpose but I don't begrudge it, if anything I was happy to be out of Frank's shoes, even if only for a moment. Wood, what little we see of him, is fantastically creepy here and when his face is first reflected in a mirror, I couldn't help but wonder why his victims didn't see the crazed look in his eyes. If I saw this guy on the street I'd be quickly crossing to the other side to avoid him. Congratulations Elijah, I will never again be able to watch Lord of the Rings without automatically thinking of you as a crazed serial killer; thanks for screwing that up for me. Maniac is not an easy watch or something that I would be quick to recommend. It's beautifully made but brutal and on more than one occasion I looked away from the screen, never mind the feeling of unease that sat with me for a day or two after seeing it but combined with Maxime Alexandre's cinematography, the set design and Rob's haunting electronic soundtrack, Maniac is fantastically effective and one of the better horror offerings of the past few years. Not for everyone but if you like your horror cinema to leave you feeling a little icky, this is definitely one to check out. 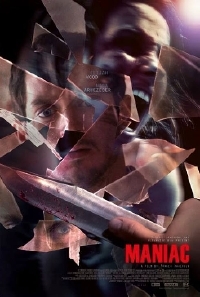 Maniac is currently available on VOD.